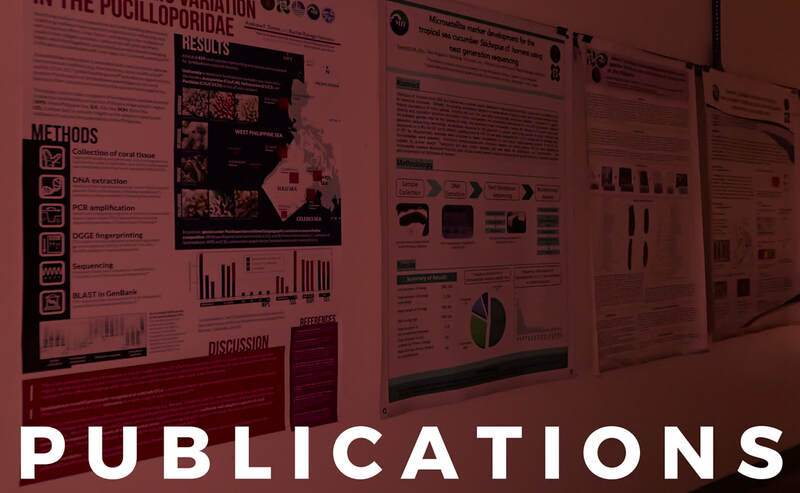 Ravago-Gotanco R, Kim KM (2019) Regional genetic structure of sandfish Holothuria (Metriatyla) scabra populations across the Philippine archipelago. Fisheries Research 209: 143-155. Torres AF, Ravago-Gotanco R (2018) Rarity of the "common" coral Pocillopora damicornis in the western Philippine archipelago. Coral Reefs 37(4): 1209-1216. Ravago-Gotanco R, de la Cruz TL, Pante MJR, Borsa P (2018) Cryptic genetic diversity in the mottled rabbitfish Siganus fuscescens with mitochondrial introgression at a contact zone in the South China Sea. ​PLoS ONE 13(2): e0193220. Ravago-Gotanco R, Juinio-Meñez MA (2010) Phylogeography of the mottled spinefoot Siganus fuscescens: Pleistocene divergence and limtied genetic connectivity across the Philippine archipelago. Molecular Ecology 19: 4520-4534. Ravago-Gotanco R, Manglicmot MT, Pante MJR (2010) Multiplex PCR and RFLP approaches for identification of rabbitfish (Siganus) species using mitochondrial gene regions. Molecular Ecology Resources 10: 741-743. Ravago-Gotanco R, Lumibao CY, Pante MJR (2010) Isolation and characterization of thirteen microsatellite markers for the rabbitfish, Siganus fuscescens. Conservation Genetics Resources 2: 225-227. Ravago-Gotanco R, Magsino RM, Juinio-Meñez MA (2007) Influence of the North Equatorial Current on the population genetic structure of Tridacna crocea (Mollusca: Tridacnidae) along the eastern Philippine coast. Marine Ecology Progress Series 336: 161-168. Ravago-Gotanco R, Juinio-Meñez MA (2004) Population genetic structure of the milkfish, Chanos chanos, based on PCR-RFLP analysis of the mitochondrial control region. Marine Biology 145: 789-801. Ravago-Gotanco R, Juinio-Meñez MA (2003) Phylogenetic position of the striped-legged forms of Panulirus longipes (A. Milne-Edwards, 1868) (Decapoda, Palinuridae) inferred from mitochondrial DNA sequences. Crustaceana 75: 1047-1059. Juinio-Meñez MA, Magsino RM, Ravago-Gotanco R, Yu ET (2003) Genetic structure of Linckia laevigata and Tridacna crocea populations in the Palawan shelf and shoal reefs. Marine Biology 142: 717-726.